1976 isn’t just the year of my birth (epoch making an event that may be). It was also the year of a fairly interesting economic policy showdown in Australia. This has been prompted by the release of the 1976 Cabinet Papers as well as some recent commentary by John Stone. This is going to be a fairly long post, so it’ll be continued over the page, to keep the important musings about movies and Lego where they belong. We had a fixed exchange rate regime. This had been the norm since WW2 (indeed, that’s what the Bretton Woods conference and the IMF were for – managing the fixed exchange rate regime). But in 1973, following the actions of the US government in tinkering with their own gold standard, the system finally ended and all the major world currencies began freely floating. But Australia remained on a fixed exchange rate, fixed to a bundle of currencies (the Trade Weighted Index). A good summary of the Australian system (which I draw on throughout this article) can be found in Blundell-Wignell, Fahrer & Heath (1993). Monetary policy was mainly conducted through reserve controls on banks, rather than today’s system of open market operations. Monetary policy also tended to target the growth of monetary aggregates (M2, M3 and so on) rather than the interest rate, and so was much more greatly concerned with the volume of money supply. Not that a lot of monetary policy was conducted in the 1970s, and what was conducted was done badly. There’s a good discussion in a speech by ex-Governor Macfarlane of the RBA. So what’s the situation in 1976? Let’s have a look at the three major economic aggregates that would have concerned policy makers: inflation, unemployment and growth. GDP in the [March] quarter increased by 3 per cent … 1976-77 can be expected to be a year of moderate economic growth in activity and employment. 1976 Cabinet Submission 533. But the valuation of the dollar had lost its footing. The high inflation meant that the real value of the dollar had fallen, and a perception developed in markets that the fixed exchange rate was overvalued. This led in turn to a sharp fall off in foreign investment, and as a result foreign exchange reserves began to decline precipitously. First, you could devalue the dollar. This would halt any speculative attack, restore capital inflows, and would also make export industries more competitive. But it would also put substantial upward pressure on inflation, as every import good would become more expensive, and there are a lot of imported goods in the basket making up the CPI. This was the position maintained pretty much only by Prime Minister Malcolm Fraser and his advisers. Second, you could seek a loan from the IMF to make up the foreign exchange reserve (something the UK would be forced to do soon after this). This was the position recommended by Treasury and the Reserve Bank. But this is really only a bandaid, and without a fix to the underlying causes wouldn’t have been successful. In reality the intended policy result was probably that the IMF would demand significant cuts in public expenditure, a policy the government had been resisting to date. But why, a modern observer might ask, couldn’t you just devalue the currency and then use monetary policy to put the brakes on inflation? Two reasons: firstly, that could easily put the country into a recession, and it could be a lot of extra inflation. But secondly, and more important, it’s almost impossible to use monetary policy in that way when you have a fixed exchange rate. Monetary policy ultimately takes effect through changes in the quantity of money in the economy. But when the exchange rate is fixed the Reserve Bank was forced to alter the quantity of money by buying or selling Australian dollars on the foreign exchange market. So, in the end, the devaluation was chosen. John Stone, with his iconoclastic devotion to the fixed exchange rate, must have smarted as a managed float was begun where the value of the dollar was changed more often. John Stone was later to lead the opposition to the full floating of the exchange rate by the Hawke/Keating Government in 1983. What’s the lesson for an economist advising the Government today? A few things. First, the policies and institutions of the past can be undone by changing world circumstances. A fixed exchange rate was a fine thing when everyone else was doing it, but by 1976 the winds were blowing clearly in the direction of a floating dollar. Treasury (i.e. John Stone) was incredibly resistant, for reasons that I have never seen spelled out clearly. With the benefit of today’s perspective we understand that the floating exchange rate provides a ‘cushion’ to the economy, helping us weather the storms around the world. Secondly, don’t treat the Government like idiots. I’m sure that Fraser had no trouble working out what was intended by an IMF loan. And thirdly, be prepared to accept that sometimes you get backed into a corner with no good way out. 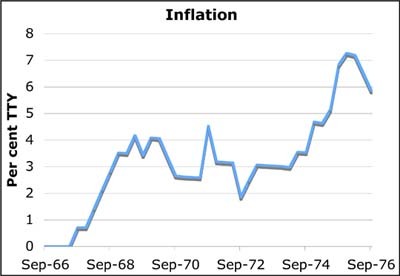 The devaluation did lead to substantial inflation – the March quarter showed the first signs of the rise, but as the imports replaced existing stocks through the year there was more and more impact until inflation had grown by 12.9 per cent in the first 12 months after devaluation, the fastest recorded inflation at that time since 1958. But a currency crisis would have been worse in terms of the effect on growth and unemployment. Perhaps the government expenditure cuts would have been the first best policy, but those were clearly off the table. All in all, looking at the macro-economic frameworks of the 1970s is enough to make you very glad of the sophisticated structures that exist today. This entry was posted on Wednesday, January 3rd, 2007 at 10:04 pm	and is filed under Economics.